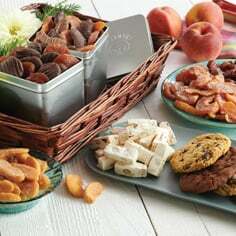 Surprise them with exclusive, extraordinary all-natural dried fruits that will satisfy all year long. 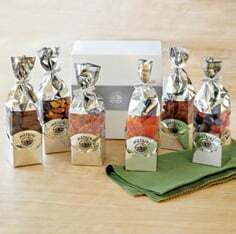 Each shipment is timed to our harvests from around the world, so your happy recipient gets the earliest pick of each crop. 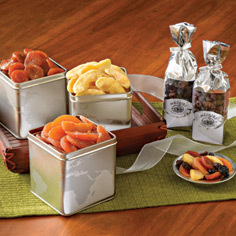 Each gift comes in our beautiful, reusable silver tins with a world map, filled with 12 oz. 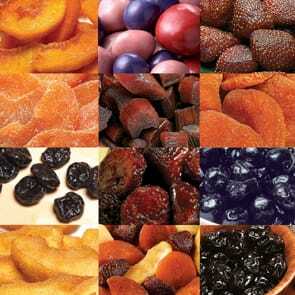 of the best tasting fruit imaginable. These dried fruit gifts are perfect for holidays, birthdays, anniversaries, clients or yourself. Start the monthly plans any month. We will send you an order confirmation. The shipment will start on the next Club shipping month after your order is placed and will continue for five months in a row after the first month's shipment. For other monthly gift options be sure to check out all of the Delights of the Month Clubs only from Meduri World Delights.